The technology of robotic floor cleaners has come a long way since the development of the Roomba, but figuring out which robot floor cleaners are the best can still be a bit difficult. This is especially true when we choose different robot vacuum cleaners from the same maker. Like with so many other devices these days, there is a legitimate question when it comes to the value of incremental design progression. That is why we present you this article where we systematically break down and compare the Deebot N79 vs. M80. While they may seem nearly identical on the surface, we will find out whether the M80 is a worthy successor to the N79 or whether you are better off just waiting for the next generation. The Ecovac Deebot N79 does not revolutionize the robot vacuum cleaners market in concerning of design–though, to be fair, neither does anyone else. It seems the general layout of a low-profile cylinder is the industry standard, though the Ecovac Deebot N79 does sport a sweet asymmetric âbrushed metalâ finish. That said, those who owned the N78 are probably a bit underwhelmed with the N79 which did not significantly improve upon its predecessor’s performance in any meaningful way making the upgrade feel a bit like a deception. When you consider that the Ecovac Deebot N79 is a reasonably expensive robot vacuum cleaner within the market, the lack of innovation only stands in starker contrast to the value provided. 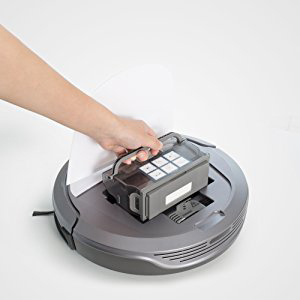 The Ecovac Deebot N79 is not a poorly performing robot vacuum cleaner and is sufficient for most settings, but short pile carpets will give it trouble. 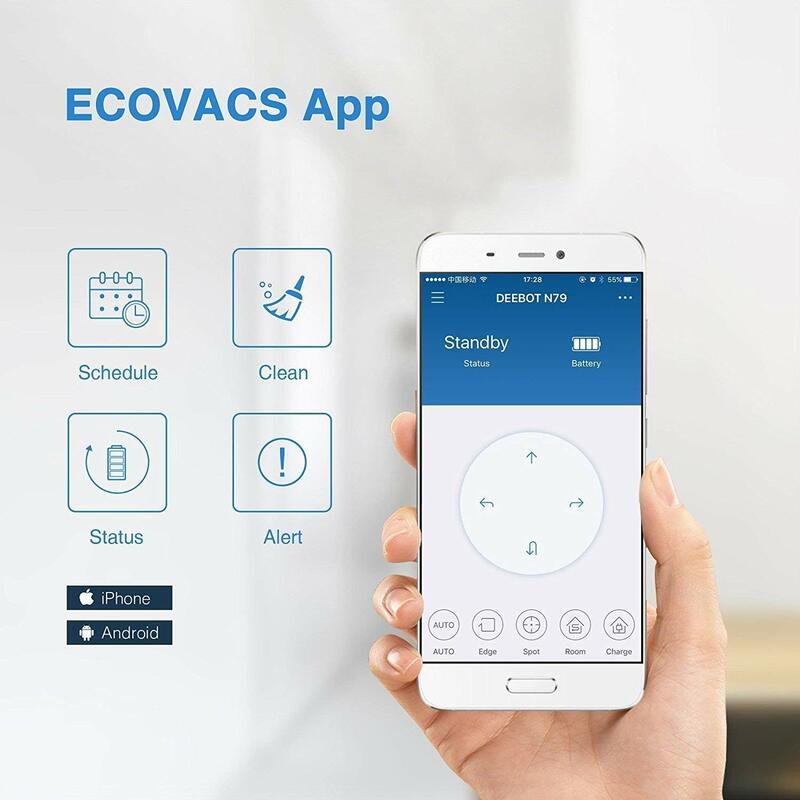 Of course, for those of you who eagerly anticipate the Internet of Things will likely still flock to the Ecovac Deebot N79 if for no other reason than because it is the first model from the maker to connect to smart devices. Because the Ecovac Deebot N79 was such a letdown compared to the N78, it would be understandable if you approach this product with a bit of doubt. And from an outward appearance, the Ecovac Deebot M80 does seem to continue this trend. However, there is a single feature of the Ecovac Deebot M80 which may well justify the upgrade–and the fact that the price difference between the 2 is around $10 makes it an even more natural choice for new buyers. However, outside of this single feature, you are getting more of the same which makes the decision a bit more difficult for those who already have a robot vacuum cleaner. At the same time, the incremental improvements that the Ecovac Deebot M80 made to the Ecovac Deebot N79 are not to be discounted out and out. While they would not necessarily justify the purchase of an Ecovac Deebot M80 upgrade, combined they do provide an all-around better experience and superior performance over the Ecovac Deebot N79 even without the additional features. However, even the combined benefit of all the incremental improvements is not enough to justify an additional expense of hundreds of dollars if you already have a decently performing robot floor cleaner. 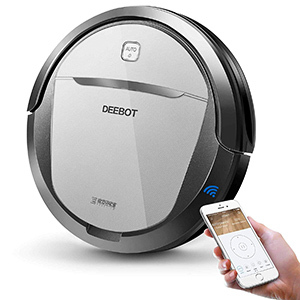 The vacuuming technologies for both the Deebot M80 and N79 are mostly the same, with the Deebot M80 surpassing the N79 in a couple of critical areas. 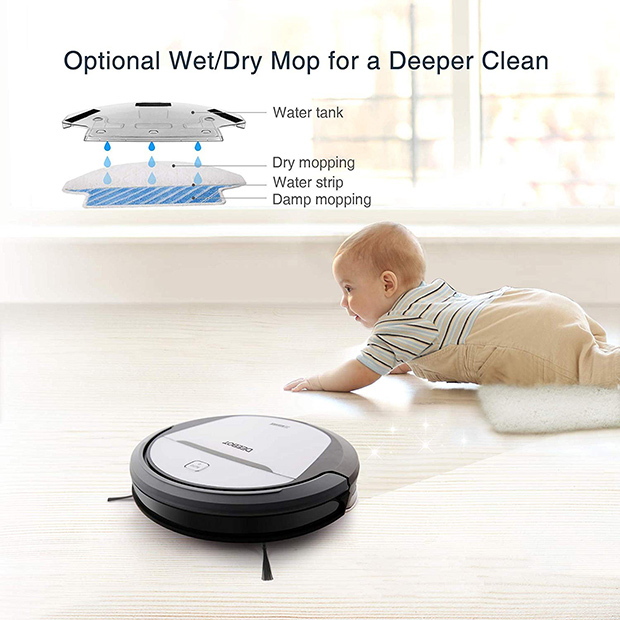 For instance, the Deebot M80 has a mopping function which the N79 does not and excludes them from being compared to one another in that category. In fact, this may arguably be the biggest reason to purchase an M80 even if you still have an N79 or even an N78. At the same time, the actual performance regarding suction power across the overlapping functions does not differ by enough to justify an additional purchase if you still have one of the earlier models. It is because 2 of the five stages of the M80 cleaning system are devoted to the mopping function which includes a drying as well. It means that for dry vacuuming purposes, the M80 uses the same 3-stage cleaning process as the N79. It is worth noting that the M80 does come with a few improvements to the engineering design and construction. So, the 3-stage dry vacuuming function of the M80 is superior to the same feature of the N79. Still, when you are considering whether or not to spend a couple of hundred dollars on a robot vacuum cleaner, those minute differences might not be enough to move the needle. Of course, you can always increase the value of a product by increasing its versatility, and the mopping functions, as well as the additional dry vacuuming performance, definitely does that. While the actual vacuuming technologies and cleaning parameters differ in terms of their engineering and build, their functional difference leaves a bit to be desired. On the other hand, when it comes to where they can clean or on what surface, the contrast between the two highlights why you might be willing to pay the cash for an upgrade–even if you already have a fully functioning robot vacuum cleaner. Specifically, the Ecovac Deebot M80 is the first in the Ecovac line to have a mopping function which drastically increases the versatility of this product type. That said, this is not an absolute panacea either, with even the M80 having strict demarcation of function such that the robot vacuum cleaner will not seamlessly transition from one to the other without input from the owner. As such, this does not allow the M80 to be indeed fully autonomous, though there are numerous features included in both the M80 and N79 which address this concern. Though not nearly as impactful to the overall value of the product, the fact that the Ecovac Deebot M80 has a superior cleaning quality across all surfaces and for all types of the mess should not be ignored. In fact, the Deebot M80 is more than capable of transferring its helical vacuuming power from bare floors to low-pile carpet to medium-pile carpet without much fuss–though, once again, you will be expected to determine which surface the Deebot M80 will be vacuuming on beforehand. While this function will not necessarily differ too terribly much between the M80 and the N79, it does not change the fact that both of these products have excellent connectivity options. Notice we used the plural forms âoptions,â because both of these robot vacuum cleaners have numerous ways to either connect to smart devices or be controlled by those devices. While these are not necessarily the most advanced products in this market, the Deebot lineup is robust regarding connectivity. 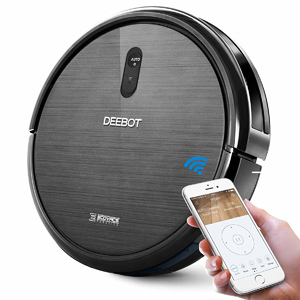 The Deebot does take a bit of a different approach than many of the other automatic robot vacuum cleaners. Specifically, the M80 and N79 both connect using a WiFi connection as opposed to a Bluetooth connection. While this is relatively common for the actual base station, it is less common for 3rd party devices. In functional terms, this allows numerous smart devices to act as a sort of temporary WiFi hub for the Deebot M80 or N79 while giving commands. In terms of performance, this means that you can still control the Deebot even through numerous walls and rooms â something that no protocol of Bluetooth can yet achieve. It is important to remember that the Deebot lineup requires a 2.4 GHz WiFi connection as opposed to the newer 5.0 GHz WiFi connection. Also, the app itself is not much to write home about, though at the same time it does not have any significant concerns either. For its use, the app is straightforward and simple to use with few controls or functions and a fairly stable build. At the same time, the app is relatively compatible concerning smart devices and does not come with any malware or bloatware. When you consider the versatility with the ease of use factor, the M80 takes the lead in this category as all of the other functions are only compounded by the inclusion of a subtly impressive function: voice activation. Though, to be clear, we are not talking about the Deebot lineup itself being voice-activated but rather that voice activation is a possibility for the M80. To wit, the M80 can be controlled by home internet systems like Alexa such that by giving commands to the home internet system your commands will then be relayed to the M80 which begins performing the desired task. Of course, this does require that you have a home internet system in the first place, but this technically makes the M80 much easier to use than the N79 as you do not even need to bother with the app or a smart device at all. Still, like many of the categories, we have seen before and most of the types to come, the overwhelming majority of usability features are similar from one model to the next â especially in regards to modular functionality. For instance, one of the few advances that the N79 hung its hat on when compared to the N78 is the inclusion of a new cleaning mode: the single room cleaning mode. The M80 counters this by not adding another mode but switching the single room cleaning mode out for an âintensive cleaning modeâ which seems to provide superior performance. While that is all well and good, it does leave one to wonder why the M80 does not run at the level of performance during all of the other modes â though it is âintendedâ to be used for particularly stubborn messes and does make a good bit more noise than the normal modes. It is an area where it may not seem that much a difference exists between the two models, but that is because we only see the similar exterior and the same specifications and do not consider why they are the way they are. For instance, the battery life of the N79 is 100 minutes with the battery life of the M80 only being 110 minutes which does not seem like much of an improvement until you understand that the M80 is doing more work to accomplish the same tasks and thus requires more energy in general. While this ultimately gets into one of the other categories on our list, âSize and Dimensions,â the fact remains that the M80 is lugging around more than the N79 and require more power even to move, let alone vacuum. In fact, the M80 has a much larger battery than the N79 at 3000 mAh to 2400 mAh–a difference of 25 percent. In that case, you would expect the M80 to run for about 125 minutes, but because of the extra load, it can only run for 110 minutes before needing to recharge. Unfortunately, Ecovac has not made any real improvement to the charging function on the docking station, so the increase in the size of the battery with the M80 also create a similar rise in the charging time of the battery as well. For example, the N79 has a reasonable charging time of between 3 to 4 hours until it is fully charged. Compare that to the M80 which requires anywhere from 4 hours at least to up to 5 hours at most until it is fully recharged. It is another area where the M80 makes incremental improvements over the N79 which, if you are keeping track, may start to add up such that the M80 weighs heavily in favor compared to the N79 in your eyes. That said, the improvements to the dustbin are enough that the sheer ease factor is impressive let alone the increase in size. Though there are still plenty of areas with room for improvement that did not see any during this iteration. When it comes to the dustbin, virtually every conceivable aspect of the M80 is improved when compared to the N79. Regarding design, the improvement is evident with the N79 being cumbersome and inconvenient opening from the backside–not to mention prone to accidental spillage, negating the point of a robot floor cleaner in the first place. Conversely, the M80 has a top opening dustbin which even features a small carrying handle to make sure that there is no accidental spillage. Even better, the M80’s dustbin is near twice the size of the N79 with a difference of 500 mL to 300 mL. In terms of maintenance, the M80 does have the additional step of cleaning the mop functioning components, but this requires little more than rinsing and drying. When looking at all of the other functions and components, the maintenance for the Deebot lineup remains pretty consistent across models. It is worth noting that because the vacuuming components are intended to be washed thoroughly, they are less prone to failure by association with the mopping function than perhaps other brands might be. This is one of the few areas where the N79 has a bit of an advantage over the M80 in that the N79 will be able to reach places that the M80 simply cannot. It is not to suggest that the increased range puts the N79 anywhere near the M80 in terms of overall performance and effectiveness, but it is definitely something to consider â especially if you have some low ledges in your home. That said, the M80 has a sizable increase in pretty much every size and dimension category compared to the N79. For the dimensions of form, the N79 has a slight advantage over the M80 in both its height clearance as well as its planar clearance. Between the two of them, the height is definitely the more limiting–though neither of them diverges by such a significant degree that it will drastically change the performance. Instead, you are liable to note that the M80 does not seem to get into quite as small of spaces as the N79 did–but this is unlikely to keep the M80 out of space entirely that the N79 could get into. Instead, the M80 is more likely not to go as far–whether for height or planar limitations â as the N79 could. One dimension that has a big difference between the two is the weight, with the N79 at around 6 Â½ pounds while the M80 tips the scales at over 9 pounds. Considering these products stay low to the ground anyway, this may not necessarily be such a big deal and goes a bit of the way in explaining the additional energy consumption, but this can be more relevant if your home has numerous or large transition strips separating the different rooms or sections of the house. Regarding design, the subtle differences between the M80 and the N79 seem trivial â and for the most part, they are â but other aspects offer a slight benefit that may not at first seem apparent. For their similarities, the M80 and N79 both present as either disc or cylindrical in much the same way that virtually all robot vacuum cleaners do. The M80 features a grey central panel with darker black accents while the N79 has a faux brushed metal finish across the top. The thing which might not first be visible is the fact that where the N79 is perfectly flat across the top, the M80 has just the faintest slope running across the face. This is important because it allows any mess that somehow gets on top of the M80 to eventually work its way back down to the floor where the M80 will promptly clean it up. With the N79, if for whatever reason something got stuck on top of the N79, it would stay there until manually removed. Outside of the dustbin differences mentioned earlier, the general design of both Deebot models is relatively similar. Both models have a single âAutoâ button on them–presumably for if you do not like to use wireless controls. Though, another slight difference with an outsized effect is the front panel on the M80 which can be removed to make cleaning the brushes â both side and V-shaped â easier. The difference in price between the N79 vs. M80 is so trivial that if you are purchasing a robot vacuum cleaner for the first time, you should get the M80. With only an average price difference of between $10 to 20, the M80 is a no-brainer in terms of providing more value for a similar cost to a first-time buyer. That said, the overall price of either product, which is more than a couple of dollars, is enough that the M80 may not justify the upgrade–unless it has been a while since you purchased your last robot vacuum cleaner. In the battle between the Ecovacs Deebot N79 vs. M80, the bright and unanimous winner is the M80. However, this is not a boxing match, and just because the M80 is better than the N79 does not necessarily mean that it is so much better as to justify the expense if you already have a fully functioning robot vacuum cleaner. On the other hand, if some of the M80’s enhanced or additional functions allow the lineup to function at all for you, then the M80 is a solid robot floor cleaner. With the ability to mop as well as handle medium pile carpet, the M80 is significantly more versatile than the N79. Still, while being all-around better in most categories–and all of the most important ones â the M80 may struggle to justify the cost as a replacement but is more than worth the price for first-time buyers.